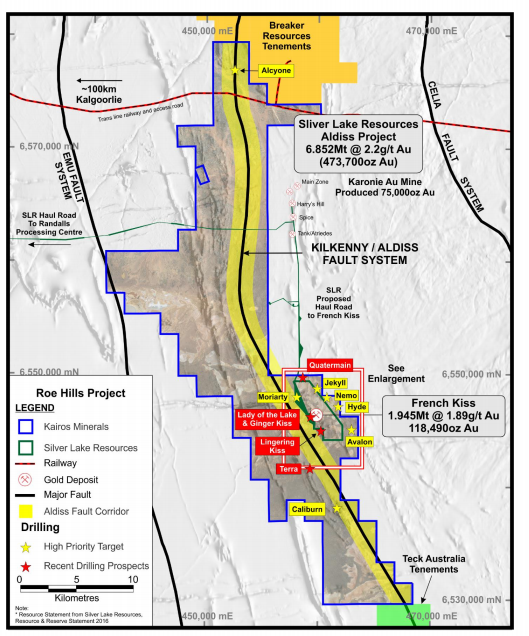 Kairos Minerals (ASX:KAI) has received promising assay results from its recent drilling program at its 100%-owned Roe Hills Project in Western Australia. The key focus of the program was previously defined gold mineralisation areas at Lingering Kiss, Terra and Lady of the Lake. The program consisted of 27 holes for 3,101 metres combined aircore/reverse circulation drilling and tested dip and strike extensions. 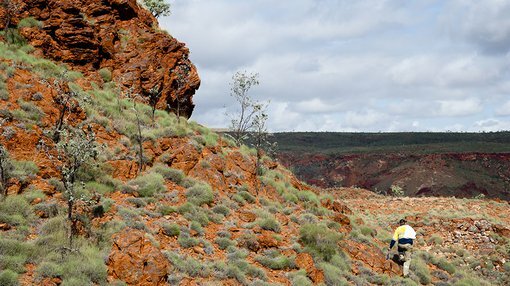 Exceptional high-grade assay results of 8.87g/t gold and 8.96g/t gold were recovered from the Lingering Kiss and Terra prospects, reaffirming extensions from mineralisation intersected in 2017. 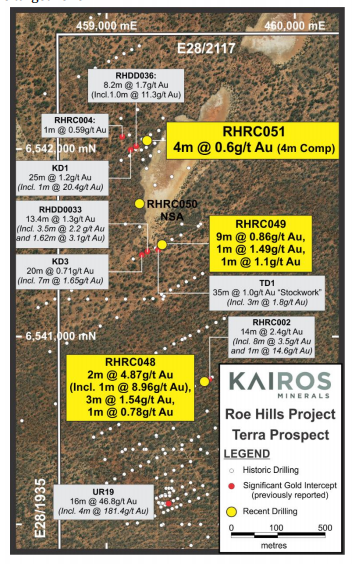 KAI has now completed three gold exploratory drilling campaigns at the Roe Hills Project, which is located along strike to the south of Breaker Resources’ (ASX:BRB) Lake Roe gold discovery and is adjacent to Silver Lake Resources’ (ASX:SLR) Aldiss Gold Project. Eight holes were completed at Lingering Kiss, with six being drilled on section 6545080mN. Drilling at this location successfully extended the anomalous gold zone, with is at least 500 metres wide. 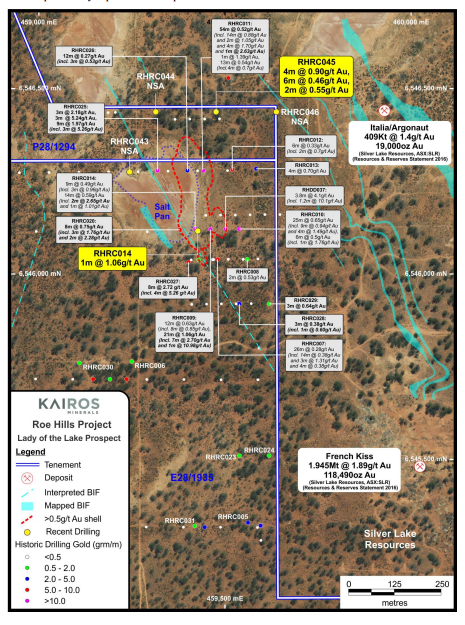 Anomalous gold mineralisation was also located in both holes drilled on section 6545000mN, indicating that the mineralisation runs southwest and is open. An additional four holes were completed at the Terra Prospect totalling 720 metres. The drilling aimed to test for extensions to mineralisation discovered in previous drilling and provide further coverage between spaced sections at the site, which are up to 500 metres apart. 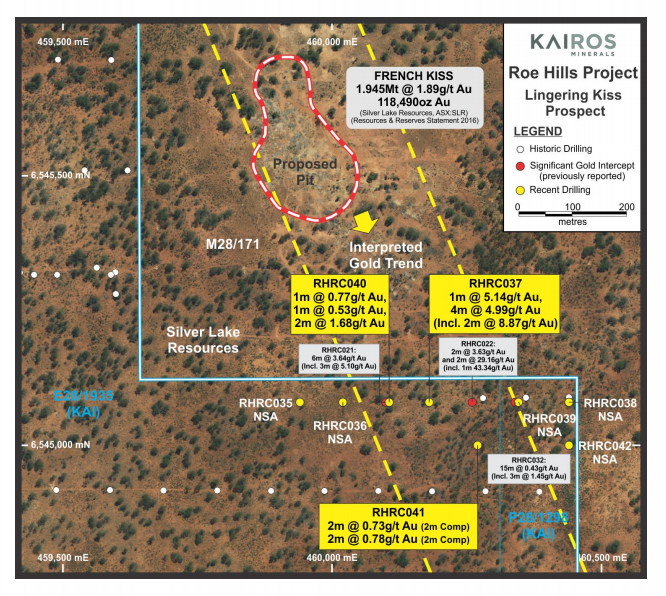 KAI indicated that all holes at Terra successfully extended the mineralisation, with the exception of hole RHRC050, which is believed to be have been located too far to the west. Five new holes and one hole extension were completed at the Lady of the Lake prospect for a total of 928 metres. The program tested for northern and western extensions to previously reported intercepts, with successful drilling at the site extending the mineralised zone a further 160m to the north of previous drilling. The company has also provided an update on its Quartermain prospect, which is located 4 kilometres north of Silver Lake Resources’ French Kiss gold deposit. KAI has completed nine shallow angled RC holes for 282 metres along two sections at the site, which are spaced 100 metres apart. The drilling targeted a robust clay-pan geochemical anomaly extending over a strike length of 600 metres with a width of up to 400 metres. 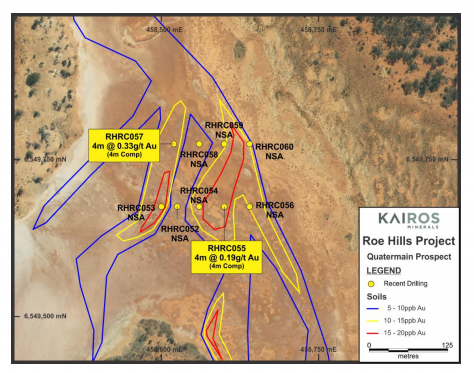 While an in-depth analysis of the geochemistry is yet to be completed, KAI has indicated that five holes returned encouraging anomalous gold values, with the most significant assay returning 4 metres at 0.33g/t gold from 18 metres (RHRC057). KAI plans to re-commence drilling across the sites once all results have been thoroughly assessed.